I’ve always loved ordering shishito peppers at restaurants for an appetizer, but for some reason never considered cooking them myself! A couple months ago while I was picking up ingredients for another recipe, I stumbled upon a bin of these yummy green peppers at Central Market. I decided to go ahead and fill up a bag, then figure out how to do it later! Most of the shishito peppers I’ve tried have featured lemon and sea salt, so I knew I was good to go with those. I did a little digging online and got some tips from some other websites (as well as Gwyneth’s It’s All Easy cookbook) on any other ingredients I needed, and how hot and how long to cook them for. Making these is surprisingly incredibly easy. All you need are ten minutes, a large pan and a pair of tongs! 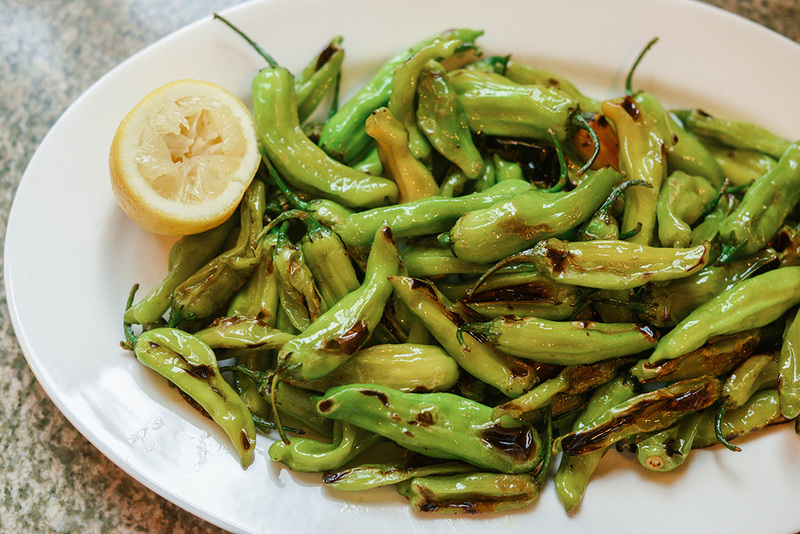 Shishito peppers make for a unique and delicious appetizer or side dish for dinner – I even made them for lunch last week! They are SUPER low-cal too. Fifty of these guys will only cost you about 107 calories, and you’d likely only eat half that if you’re sharing the app with someone else! That’s more or less how many you see in the photos here when I cooked them as my lunch. They are flavorful, but mostly mild. One in about every ten peppers is really spicy, but the rest are totally fine. Rinse off the shishito peppers in a colander and set aside. Throw a tablespoon or two of olive oil into a large pan or wok at high heat. Once the pan is hot, but before the oil starts to smoke, pour the shishito peppers into the pan. Sauté on high heat for 5-10 minutes, stirring frequently with tongs. 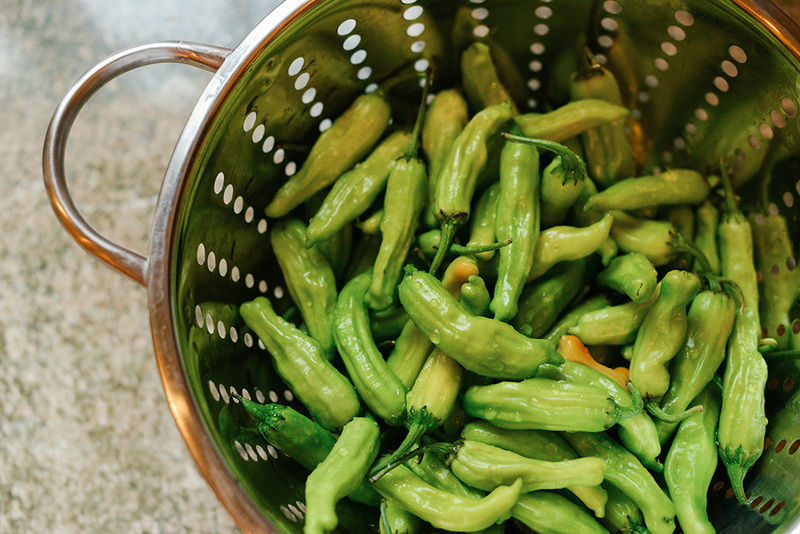 Once the shishito peppers are cooked, they’ll start to blister all over and shrink a little bit – I like mine really soft, so I may cook mine longer than you might want to. Just eyeball it! 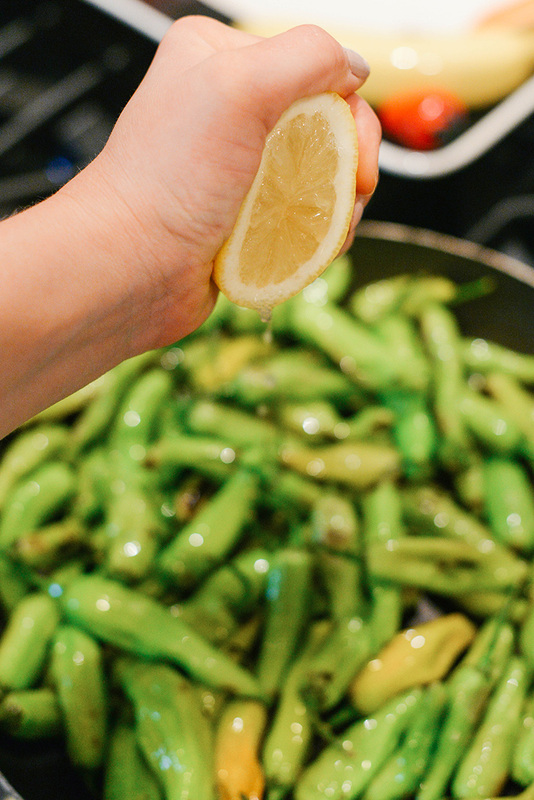 Before you take them off the heat, squeeze the juice from one lemon and sprinkle sea salt over the peppers and toss. Once thoroughly coated, remove from heat and place in a serving dish. 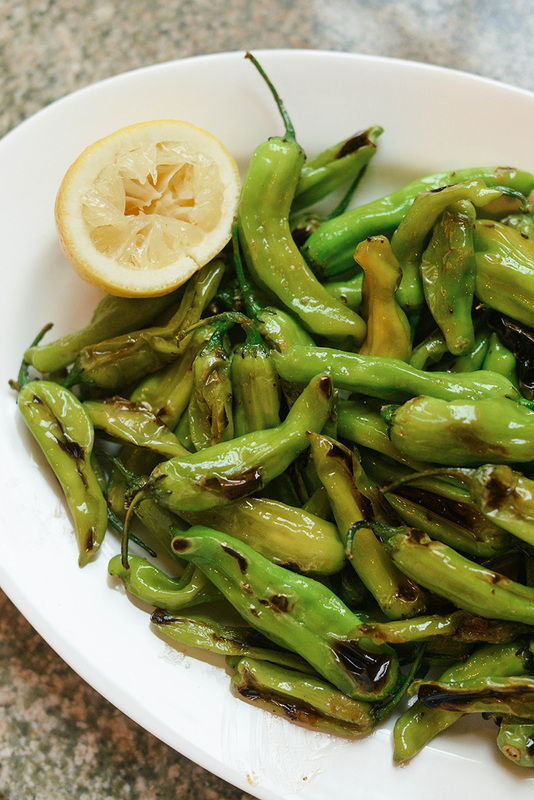 For a little extra flavor, drizzle some Tamari or soy sauce over the peppers and serve! These look DELICIOUS! I have to confess that I have always wondered about ordering these in a restaurant but I’ve always been afraid of being disappointed in them. I’m going to try them at home! That’s hilarious!! Yeah, you’ve gotta be careful!